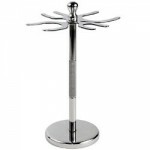 Manufactured of Stainless Steel this attractive and well build shave stand will last for years and allow you to store your razors and brushes properly. The prongs for the safety razors are 12mm. The shaving brush prongs are 25 and 31mm. Design of this stand will insure you can hang 2 razors and up 2 to shaving brushes of varying sizes. • Manufactured with Stainless Steel! • Ingenius design can accomodate one small brush and or 1 large brush.